Matthew Apgar - mapgar@shawmedia.com Belvidere North High School athletic director Jody Flynn, left, hands over the championship plaque to Huntley's (from left:) Kayla Barreto, Paige Renkosik, and Ali Andrews after beating Rockford Auburn during their IHSA Class 4A Belvidere North Regional girls basketball final on Thursday, Feb. 18, 2016 at Belvidere North High School in Belvidere. Huntley won 66-40 to clinch the regional championship. 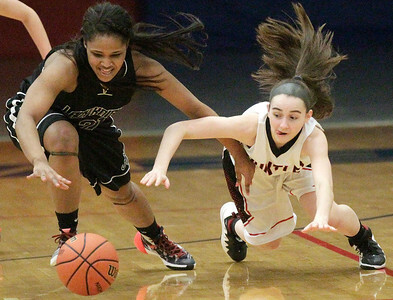 Matthew Apgar - mapgar@shawmedia.com Ali Andrews of Huntley, right, tries to make her way to the hoop despite pressure from Rockford Auburn's Natia Patterson, front left, and Niaja Taylor, back left, during their IHSA Class 4A Belvidere North Regional girls basketball final on Thursday, Feb. 18, 2016 at Belvidere North High School in Belvidere. Huntley won 66-40 to clinch the regional championship. 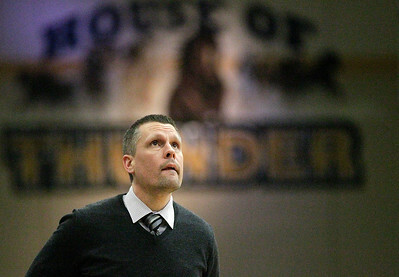 Matthew Apgar - mapgar@shawmedia.com Huntley coach Steve Raethz watches the scoreboard with mere seconds left in the final quarter against Rockford Auburn during their IHSA Class 4A Belvidere North Regional girls basketball final on Thursday, Feb. 18, 2016 at Belvidere North High School in Belvidere. Huntley won 66-40 to clinch the regional championship. Matthew Apgar - mapgar@shawmedia.com Huntley's Kaylee Andrea, right, dives for the ball with Rockford Auburn's Natia Patterson, left, during their IHSA Class 4A Belvidere North Regional girls basketball final on Thursday, Feb. 18, 2016 at Belvidere North High School in Belvidere. Huntley won 66-40 to clinch the regional championship. 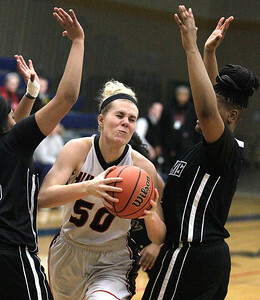 Matthew Apgar - mapgar@shawmedia.com Huntley's Morgan Clausen, left, and Paige Renkosik, right, battle for the ball with Imani Brown of Rockford Auburn during their IHSA Class 4A Belvidere North Regional girls basketball final on Thursday, Feb. 18, 2016 at Belvidere North High School in Belvidere. Huntley won 66-40 to clinch the regional championship. Matthew Apgar - mapgar@shawmedia.com Huntley starters watch from the bench as the clock counds down in the fourth quarter against Rockford Auburn during their IHSA Class 4A Belvidere North Regional girls basketball final on Thursday, Feb. 18, 2016 at Belvidere North High School in Belvidere. 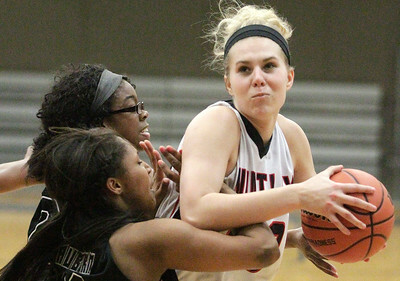 Huntley won 66-40 to clinch the regional championship. Matthew Apgar - mapgar@shawmedia.com Huntley's Ali i Andrews gets sandwiched between India Flannigan, left, and De'Aija Vines-William of Rockford Auburn during their IHSA Class 4A Belvidere North Regional girls basketball final on Thursday, Feb. 18, 2016 at Belvidere North High School in Belvidere. 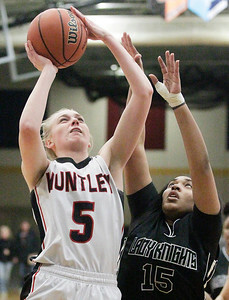 Huntley won 66-40 to clinch the regional championship. 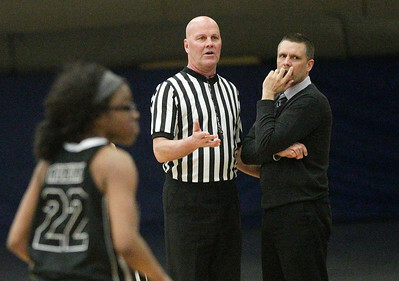 Matthew Apgar - mapgar@shawmedia.com Huntley coach Steve Raethz talks with an official at the start of the second quarter against Rockford Auburn during their IHSA Class 4A Belvidere North Regional girls basketball final on Thursday, Feb. 18, 2016 at Belvidere North High School in Belvidere. 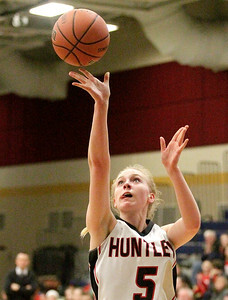 Huntley won 66-40 to clinch the regional championship. Matthew Apgar - mapgar@shawmedia.com Huntley's Morgan Clausen, left, shoots the ball over India Flannigan of Rockford Auburn during their IHSA Class 4A Belvidere North Regional girls basketball final on Thursday, Feb. 18, 2016 at Belvidere North High School in Belvidere. Huntley won 66-40 to clinch the regional championship. Matthew Apgar - mapgar@shawmedia.com Huntley coach Steve Raethz talks with the Red Raiders between periods during their IHSA Class 4A Belvidere North Regional girls basketball final against Rockford Auburn on Thursday, Feb. 18, 2016 at Belvidere North High School in Belvidere. Huntley won 66-40 to clinch the regional championship. 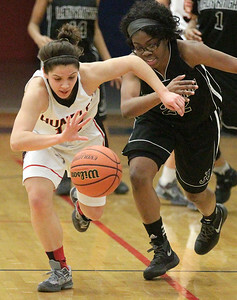 Matthew Apgar - mapgar@shawmedia.com Huntley's Kayla Barreto, left, breaks away with the ball downcourt as Niaja Taylor of Rockford Auburn gives chase during their IHSA Class 4A Belvidere North Regional girls basketball final on Thursday, Feb. 18, 2016 at Belvidere North High School in Belvidere. Huntley won 66-40 to clinch the regional championship. 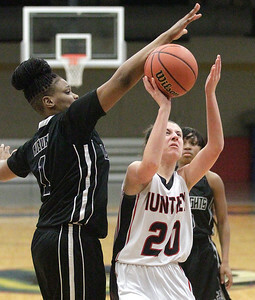 Matthew Apgar - mapgar@shawmedia.com Huntley's Mallory Moffett, right, takes a shot against De'Aija Vines-William of Rockford Auburn, left, during their IHSA Class 4A Belvidere North Regional girls basketball final on Thursday, Feb. 18, 2016 at Belvidere North High School in Belvidere. Huntley won 66-40 to clinch the regional championship. Matthew Apgar - mapgar@shawmedia.com Morgan Clausen of Huntley takes a shot against Rockford Auburn during their IHSA Class 4A Belvidere North Regional girls basketball final on Thursday, Feb. 18, 2016 at Belvidere North High School in Belvidere. Huntley won 66-40 to clinch the regional championship. 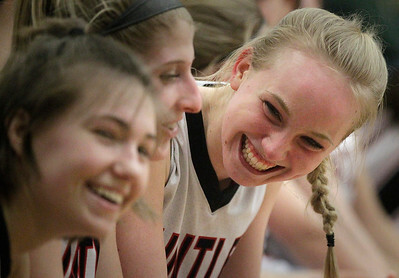 Matthew Apgar - mapgar@shawmedia.com From left: Alexiz Lowitzki, Paige Renkosik, and Morgan Clausen are all smiles on the bench as the Red Raiders enjoy a commanding lead against Rockford Auburn during their IHSA Class 4A Belvidere North Regional girls basketball final on Thursday, Feb. 18, 2016 at Belvidere North High School in Belvidere. Huntley won 66-40 to clinch the regional championship. 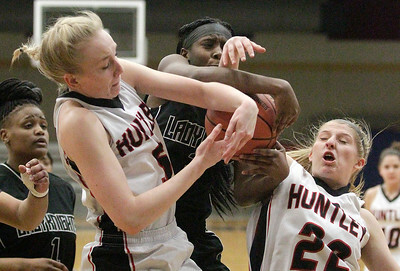 Huntley's Morgan Clausen, left, and Paige Renkosik, right, battle for the ball with Imani Brown of Rockford Auburn during their IHSA Class 4A Belvidere North Regional girls basketball final on Thursday, Feb. 18, 2016 at Belvidere North High School in Belvidere. 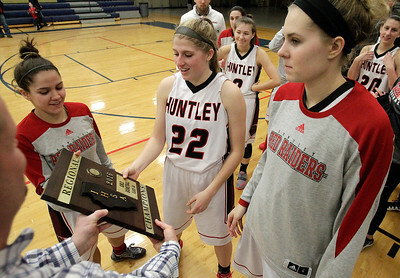 Huntley won 66-40 to clinch the regional championship.